Each year over 4000 game industry professionals, developers, and enthusiasts gather together at the White Nights Mobile and Social Games Conference. This international game development and marketing conference takes place three times annually. It begins in February in Helsinki, continues in June in St. Petersburg and culminates in October in Moscow. Organized by established St. Petersburg-based casual game developer, Nevosoft, the White Nights conference features developer exhibitions, the Indie Game Cup competition, and the famous Game Industry Awards ceremony. Pavel Ryaykkonen, Nevosoft co-founder and COO, opened this year’s conference with a keynote speech, which analyzed the gaming industry’s present state and what’s to come. The White Nights Game Industry Awards ceremony celebrates the accomplishments of professionals in the mobile gaming industry through an open voting process. Winners were selected through two rounds of voting, the first taking place January 11 to 15 and the second from January 18 to 22 of this year. The awards ceremony includes five categories: advertising and monetization, analytics platform, localization service, sound in games, and platform partner relations. 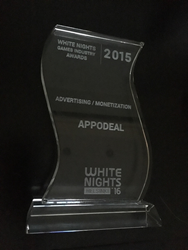 Programmatic ad mediation solution, Appodeal, won in the category of advertising and monetization for their professional achievements. The announcement was made at the official White Nights conference party in Helsinki on February 11, 2016. There’s another conference on the horizon in St. Petersburg. The 10th White Night conference will take place on June 28 - 29, 2016. Up to 1,500 visitors are expected to attend. This conference allows talented teams to mix, mingle and present their best projects in order to connect with partners, investors, publishers, and platforms. Appodeal is one of the most promising and rapidly growing ad-tech startups in San-Francisco with representatives in Russia and Spain. Designed for publishers by publishers, Appodeal increases revenue through an established marketplace where ad networks compete against each other in real-time for every ad impression.